It's December 2nd. The Christmas season is already half over, that is, if we're going by the fact that Christmas wares hit the shelves the second the candles fizzle out in our Jack-o-lanterns. 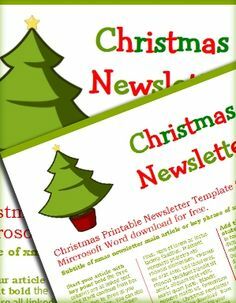 Don't fret; you still have plenty of time to get into the Christmas writing spirit and what better way than a creative holiday newsletter? While it's nice to hear what awards little Jimmy won this year, or what new job so-and-so started, an entertaining Christmas letter is bound to not only get read, but shared and maybe even posted on the refrigerator. This is also a great opportunity to prove to friends and family that the rumors are indeed true: you're a writer. Change Your Perspective. Write from the point-of-view of the family pet, an imaginary grouchy neighbor, or one of your book characters. And it's amazing how observant your Elf on a Shelf can be. Borrow From the Masters. Everyone loves to read a fresh take on old classic. Liven up T'was the Night Before Christmas, The Twelve Days of Christmas, or even Jingle Bells with your own humorous, family-themed rendition. Tell a Story. Put your writing chops on display with a short and sweet holiday classic of your own whether it be a flash fiction piece, a song, or a poem. You could even make it a progressive story by adding a new installment every year. Think outside the boxed holiday cards this year and consider giving the gift of storytelling.